Angelina Jolie is not Lara Croft this time around and we are blessed with Alicia Vikander in the title role. The story starts 7 years after the death of Lara’s father and finds her living as a bike courier while doing MMA training every morning. Lara’s father of course is a billionaire businessman who owns countless companies but she refuses his inheritance because she will never accept he is dead. When she finally gives up and heads into the boardroom to sign all the paper work, her father’s attorney gives her a puzzle. Lara quickly solves the puzzle which contains a key and a riddle. She then heads to her father’s estate and uses the key to open his secret work room. Turns out her Dad was a poor man’s Indiana Jones played by Dominic West. He tells her if I’m dead burn all of these files, but instead she studies the files and maps to head off and find the place her father was looking for. Of course there is a huge conspiracy and a company trying to open the tomb. Enter Walton Goggins as the villain and we spend the next hour playing cat and mouse and raiding some tombs. Vikander, Goggins, and West are doing as much as they can with the material they are given. All three are great actors and I enjoy them in almost everything they do, but the plot is standard fare and the movie slowly turns into a typical paint by numbers adventure we’ve seen 1,000 times. It really gets close to being good thanks to the actors, but they can’t overcome it. Its like if Lebron James played with 4 of me on his team. Everyone would praise Lebron, but would say I dragged the team down. The action sequences were a highlight and I’m pretty sure this role was originally meant for Tom Cruise, because Alicia Vikander RUNS SO MUCH. SO MUCH RUNNING. RUNNING WITH A BOW AND ARROW. RUNNING WITH A PICK-AXE. RUNNING WITH A BACKPACK. RUNNING WITH A GUN. SHE JUST KEPT ON RUNNING. The tomb traps were pretty cool with today’s special effects, but I’d seen them all before, so none of them shocked me. The movie obviously goes out of its way in the final 10 minutes to set up a sequel, but it all seems tacked on and barely earned. Overall, unless you are a Tomb Raider video game weirdo or just love Walton Goggins as much as I do, there isn’t much to recommend here that you haven’t seen before. 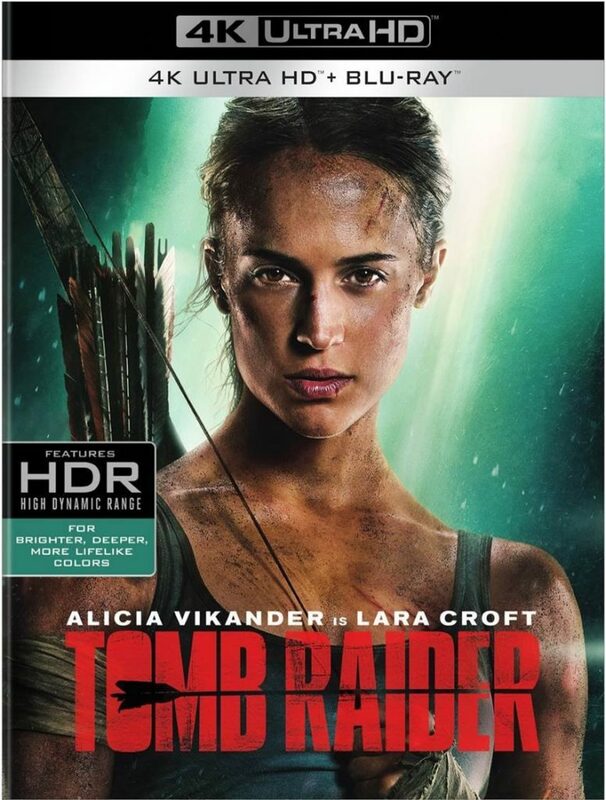 The Video: This new version of Tomb Raider comes with a 2160p UHD image in 4K with HDR10 and glorious Dolby Vision. It’s a significant upgrade from the standard Blu-ray version in 1080p HD for sure. Detail and colors are upgraded ten fold, making this motion picture look excellent. The detail in the actor’s beards and faces during closeups are amazing with every individual scraggly hair showing up easily. You’ll even be able to distinguish the different colors in their facial hair. Facial pores, practical makeup effects, and other scars look great as well here. Wider shots of the big set pieces showcase the natural wildlife and jungle-like areas nicely too. I was certainly impressed during the darker scenes on how well detail showed up on the actors and props. Now to talk about the CGI effects here, they aren’t that spectacular, and with the 4K UHD presentation, it’s downright laughable at times, meaning it looks completely fake. It’s a small price to pay for a crystal clear image. Nothing looks soft, but you can tell when CGI meets reality, and it’s a bit of a distraction. Colors pop right off screen at all times, including bright primary colors, no matter if it’s in the light of day or in a dark cave – all colors are enhanced with the Dolby Vision, which makes the film look beautiful in this chaotic Earthy jungle setting. Black levels are always deep and inky without any crush and the skin tones are always natural to a tee. There were no issues with banding, aliasing, or video noise to speak of, leaving this dynamic image fantastic, despite the shoddy CGI effects in several scenes. The Audio: This 4K release comes with an impressive Dolby Atmos track that rocks the speaker system. Sound effects are robust and loud on every occasion, which makes for a fully immersive soundtrack. The directionality is spot on as well as you can tell where arrows or guns are blasting about with a smooth range of motion throughout the height and direction speakers. There are a few scenes in particular that stick out, being a chase scene in the middle of London, and a few of the Jungle action sequences that truly make this audio mix shine. Every vehicle motor or citizen talking in the city sounds full with added heigh sounds that give you the sense of the big city. Now when in the Jungle, all of the animal and plant life, along with water and people’s footsteps sound magnificent and completely puts you in the center of the action. It’s a wonderful moment for sure. The score always adds to the intense sequences, as well as the suspenseful moments throughout without drowning out any aspect. The echoes and reverb in the caves provide a natural cavern element that seems perfect. The bass kicks into high gear throughout, but never crosses into rocky territory. Dialogue is clean and clear, and easy to follow, even in the midst of all the action set pieces, and is free of any pops, cracks, hiss, and shrills. Tomb Raider: Uncovered (HD, 7 Mins.) – This is promo fluff piece with cast and crew interviews, and some on set footage. It’s not a great extra and doesn’t offer a ton of insight, other than the similarities to the popular 2013 video game. Croft Training (HD, 6 Mins.) – This shows how Alicia Vikander trained for her role in many aspects, but again, it’s a promo fluff piece. Breaking Down the Rapids (HD, 6 Mins.) – This is a brief look at how the filmmakers made the big action sequence with Croft floating down the rapids, trying to survive. Lara Croft: Evolution of an Icon (HD, 10 Mins.) – This covers all of the video games in the Lara Croft franchise, and how they were used to creature the movie. This new ‘Tomb Raider‘ movie has a lot of issues. None of which is shown is original, but rather the same old story and action set pieces you’ve seen in countless other films. It’s pacing is off and the characters just aren’t that likable. Still, there is some decent things in here if you enjoy the video games from the past decades, but other than that, it’s a forgettable movie. The video and audio presentations are both amazing and make this movie worth watching for the incredible visuals when the screen isn’t heavily covered in CGI. There isn’t too much about the extras that are interesting or informative either. This is strictly for Fans of the Franchise only. 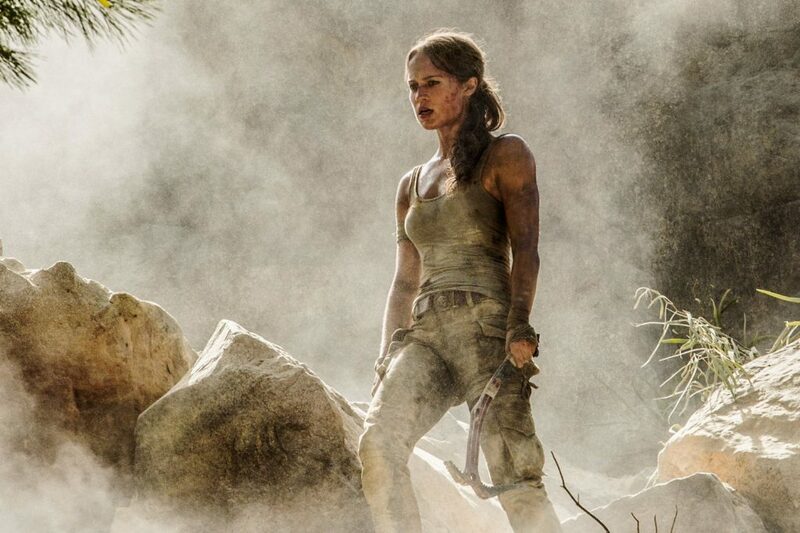 We’ve got the latest trailer for ‘Tomb Raider’!!! Film Review: ‘Tomb Raider’ (2018)! Dan Moran’s Review of ‘Ant-Man and the Wasp’! This entry was posted on Thursday, June 14th, 2018 at 1:54 pm	and is filed under Film, News. You can follow any responses to this entry through the RSS 2.0 feed. You can skip to the end and leave a response. Pinging is currently not allowed. « Film Review: ‘The Incredibles 2’! Dad, where are the letters? I don't have them, son. [Another pause] Where are they? I ''donated'' them to the Franklin Institute in Philadelphia.